This rare space wallpaper taken on July 19, by NASA's Cassini spacecraft shows Saturn's rings and our planet Earth and its moon in the same frame. This rare space wallpaper taken on July 19 by NASA's Cassini spacecraft shows Saturn's rings and our planet Earth and its moon in the same frame. The dark side of Saturn, its bright limb, the main rings, the F ring, and the G and E rings are clearly seen; the limb of Saturn and the F ring are overexposed. The ‘breaks’ in the brightness of Saturn’s limb are due to the shadows of the rings on the globe of Saturn, preventing sunlight from shining through the atmosphere in those regions. 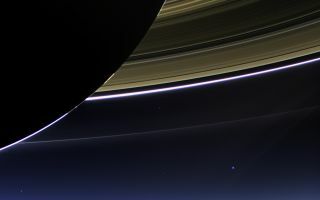 Earth, 1.44 billion km away in this image, appears as a blue dot at center right; the moon can be seen as a fainter protrusion off its right side. The other bright dots nearby are stars. This image was released July 23, 2013.